"This is an awesome, addictive, one hundred percent vegan granola. We always have a batch of this on hand to sprinkle on soy yogurt or eat with soy or rice milk." Preheat oven to 350 degrees F (175 degrees C). Prepare two cookie sheets with cooking spray. In a large bowl, combine oats, wheat germ, almonds, cinnamon and nutmeg. In a separate bowl, mix apple juice, molasses and extract. Pour the wet ingredients into the dry ingredients, stirring to coat. Spread mixture onto baking sheets. Bake for 30 minutes in preheated oven, stirring mixture every 10 to 15 minutes, or until granola has a golden brown color. Let cool. Stir in dried fruit. Store in an airtight container. Super chocolaty with minimal sugar! Very good!! Next time I'm going to substitute the molasses with Agave to see how that turns out. This is a great snack. I found that 30 minutes was a bit too long when using 2 baking sheets, so the next time I just used one. I may try 2 baking sheets again for 20-25 minutes. Easy to make and my family loves it. This was great! I followed the recipe exactly, and it turned out wonderfully. 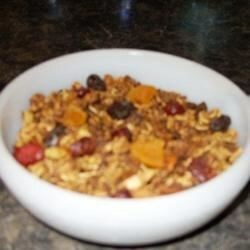 Make sure to stir the granola every 10 minutes, as the edges get very browned. Thanks for the recipe!